5 O/Clock Somewhere - Bear Camp Cabin Rentals. "5 O/Clock Somewhere" is a beautiful 2 story all-wood cabin that offers a perfect place to relax and unwind while visiting the Great Smoky Mountains. This gorgeous custom-built 2 bedrooms 2 bathroom cabin that sleeps 8 offers all the amenities of home, but is only minutes from Pigeon Forge, Gatlinburg, and the area attractions and is located in the Sky Harbor area which is located between Pigeon Forge and Gatlinburg. You are also approximately 18 minutes from the Ripken Experience. The road to the cabin is paved, but does have inclines and curves and would only be considered motorcycle friendly at the rider's discretion. There are 4 steps to reach the entrance landing, with a pleasant surprise when you open the door to discover the beautiful wood interior throughout the cabin and open floor plan. The cabin offers a fully equipped kitchen with stainless steel appliances and seating for 6 people comfortably at the dining room table. Adjacent to the kitchen area you will find the living room with a comfortable futon, recliner, flat screen TV, and a electric fireplace for those cold winter nights. Also located on this level, you will find the game room with a pool table for the guest who loves to have a friendly game and mini-fridge for your convenience. You will have a queen size bedroom located right off of the game room with a flat-screen TV and full bathroom with a shower/tub combination which is separate from the bedroom and located across from the washer and dryer. The master bedroom is located on the upper level. There is a king size bed, large flat screen TV, jacuzzi tub and a full bath with a shower/tub combo. Off of the master bedroom, you have your very own private deck with 2 rockers to enjoy the wooded view and all nature has to offer. Also, you will find a queen size sleeper sofa located in the spacious master suite. On the main level deck, you will find the hot tub which is perfect for relaxing and soaking in after a long day of hiking or sightseeing. "5 O/Clock Somewhere" encourages relaxation and family time both inside and outside. Enjoy a morning cup of coffee while relaxing on the deck or watch the nature that surrounds you. If you are looking for a great cabin for your vacation, but you want both peacefulness as well as proximity to the Parkway and to all the area attractions, then look no farther than "5 O/Clock Somewhere" and enjoy an amazing mountain vacation. Don't miss out---Book this cabin today!!!!! This cabin is NOT pet-friendly. Dollywood, Dollywood's Splash Country, Dolly Parton’s Stampede, Crave Golf Club, Ripley’s Aquarium of the Smokies, Ober Gatlinburg, Anakeesta, Sugarland’s Visitor Center, access to hiking trails, The Ripken Experience. The cabin was beautiful and so clean!! The staff was so friendly as usual!!! Excellent customer service!!.. excellent cabins. Top notch!!! Friendly staff and answered all questions. Excellent cabin & location! Will definitely return and stay at Honey Bear Hill again!! The customer service was fantastic. I had 2 issues, the handle was broken off of the over-the-range microwave and the pots and pans looked horrible. The next morning after our check in I was given a courtesy call to see how it went and I let them know those issues and they were resolved within about 10-15 min. Cabin was very clean and well kept. AT THE CHECK IN THE SERVICE WAS OUTSTANDING. WE HAD ZERO ISSUES AT CHECK IN AND THE INDIVIDUAL WAS OUTSTANDING AND SO FRIENDLY. ALSO WE HAD SEVERAL FOLLOW UP CALLS TO MAKE SURE EVERYTHING WAS OK, WHICH WAS ALSO OUTSTANDING. IT ALSO SNOWED AND WE WERE PROVIDED WITH SNOW SHOVEL AND ICE MELT AFTER THE SERVICE DESK HAD UPDATED US ON WEATHER CONDITIONS THAT WAS BEING FORECAST FOR THE AREA STAYING IN. ALSO THE CABIN WAS VERY CLEAN AND WELL MAINTAINED. WE HAD OUTSTANDING VISIT. We were very happy with our stay and the team at Bear Camp Rentals. The reservation and check-in process were done very well with no issues or challenges. The cabin was ready for us and in good shape when we arrived and we had no problems during our 3 night stay. The entire experience was very pleasing. The cabin was very clean and well maintained. The staff was very helpful and extremely polite. The cabin was beautiful, well stocked and clean...we had a wonderful time and hope to a come back again soon. Staff was friendly and very helpful. Cabin was Great! Customer service is excellent. Our reserved cabin became unavailable and the staff put us in an upgraded cabin. We had a great time at Honey Bear Hill. Thanks for making our vacation a fun time. Had a great time. Thanks for making new arrangements since reserved unit was not ready to rent. Honey Bear Hill was a great cabin. Everything was great! We enjoyed the honey bear hill cabin, it was very up to date and clean. I would recommend yall to other people. 5 star Had a great time.smooth registration,clerk was very helpful and courteous. Cabin was beautiful,neat and clean. Would definitely come every year. Check in was a breeze and the direction to the cabin was easy to follow. The cabin was very nice and clean, it was more than we had expected. Had a problem with a missing curtain blinds in the upstairs bedroom, but got the okay from the staff to move one from downstairs. My husband and I will be using Bear Camp Rentals again, and recommend them to anyone who will be vacationing in the Tennessee mountains. The staff when we checked in was so friendly and very helpful. The cabin was very clean and was well stocked with daily necessities. 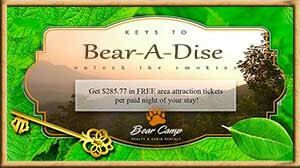 We love straying at Bear Camp Cabins, we return at least once a year. The driveway was a little steep. I guess that's just the mountains. We had a great time. Cabin was really nice and clean. We enjoyed the hot tub and the beds were comfy. Overall a great experience and we would definitely consider staying with ya'll again. Cabin was very nice and private. Will stay here again.